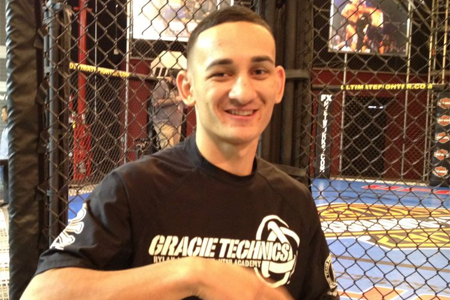 A featherweight affair between Max Holloway (Pictured) and Justin Lawrence kicked off Saturday’s “UFC 150: Henderson vs. Edgar” pay-per-view broadcast. Lawrence connects with an overhand right. He follows up with a left hook. Holloway lands an accidental kick to the groin and time is called. Game on. Holloway tags him with a left hook, but got taken down momentarily for his efforts. Blood is trickling down from the right side of Lawrence’s forehead. Holloway scores with a knee to the grill. Lawrence counters with a one-two combination. Holloway clocks him with a head kick. Lawrence takes another shot to the groin just as the horn blares. Close round to score. Lawrence is starting to work his kicks. He lands a spinning back-fist. Holloway clobbers him with a straight right. Lawrence’s takedown attempt gets stuffed. Lawrence beginning to beat the Hawaiian to the punch on a more consistent basis. Holloway thwarts another takedown try. Holloway gets him with a right hand and knee to the midsection. Holloway drops him with a vicious left to the body. He’s giving Lawrence the business. Game. Set. Match, Holloway.